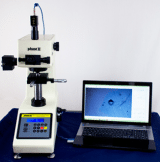 As a variety of new materials are being introduced to the market and products continue to be downsized, the significance of micro hardness testing has increased dramatically. CM-800 Series Micro Indentation Hardness Testers are amazingly accurate, utilizing advanced technology with an emphasis on user friendliness. Combine the CM Series with the available automated system (ARS) for flexibility that grows as your needs do. The ARS-10K is a fully automatic testing system capable of programming, indenting, viewing and recording in one convenient location. By configuring the ARS-10K to your specifications, the CM-Series performs Micro indentations from 1-1000gf in either Vickers or Knoop; or both using the optional dual indenter, while the CV-Series performs Macro/Vickers indentations from 0.3-50kgf. For accuracy and productivity, the ARS-10K is the perfect all-in one system. • Various data outputs available – Measurement data, hardness distribution chart, case depth, max. value, min. value, mean value, dispersion standard deviation, coefficient of variation, OK-NG criteria, conversion data, etc. 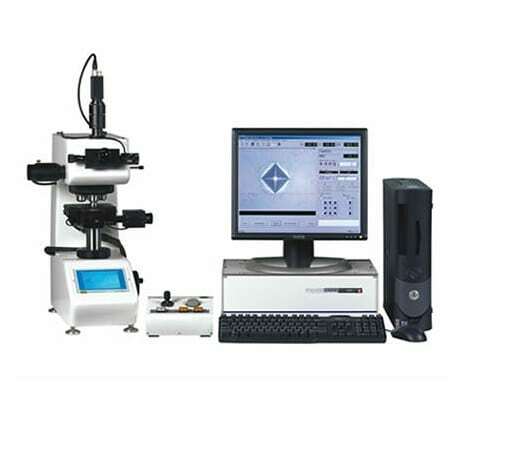 This Micro Vickers hardness tester is a precise testing system suitable for hardness analysis of metallic specimens in metallography laboratories or production environments. Our advanced line of Micro Vickers Series hardness testers are state-of-the-art, precise testing systems suitable for hardness analysis of metallic specimens in metallography laboratories or production environments. The Phase II micro-vickers hardness testers are versatile and user-friendly systems, designed for the accurate hardness testing of small precision parts, thin materials, coatings, wires and case depth determinations. The Phase II 900-390 Series micro-vickers hardness testers include Video Cam, Adapter, USB Output Cable and a choice of 2-variants of Measurement software giving you the capabilities of machines that cost thousands more. The 900-390 Micro Vickers hardness testers cover the load range from 10g to 1kg. Conforming to ASTM E-384/92 vickers hardness testers standards, the 900-390 series micro vickers hardness testers will offer unmatched repeatability. 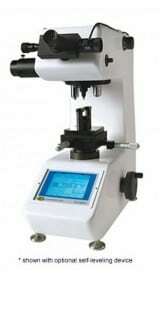 This micro Vickers hardness tester can also measure Knoop hardness after installing an optional knoop indentor. A perfect rugged performer suited for any environment, the Phase II vickers hardness testers are offered with a 5 year warranty and free lifetime technical support. The Phase II micro-vickers hardness testers are versatile and user-friendly systems, designed for the accurate hardness testing of small precision parts, thin materials, coatings, wires and case depth determinations. The Phase II 900-391 Series micro-vickers hardness testers include Auto-Turrett, Video Cam, Adapter, USB Output Cable and a choice of 4-variants of Measurement software giving you the capabilities of machines that cost thousands more. The 900-391 Micro Vickers hardness tester covers the load range from 10g to 1kg. Conforming to ASTM E-384/92 vickers hardness testers standards, the 900-391 series micro vickers hardness testers will offer unmatched repeatability. This micro Vickers hardness tester can also measure Knoop hardness after installing an optional knoop indentor. A perfect rugged performer suited for any environment, the Phase II vickers hardness testers are offered with a 5 year warranty and free lifetime technical support. The 900-398 Vickers Hardness Tester which includes precision video and measurement software package is engineered to produce a clear indentation and a more precise measurement. By means of a load cell, closed circuit system for control, the CPU controls testing force to load/dwell/unload, allowing for the highest degree of accuracy. The large LCD shows the measuring methods, the testing force, the indentation length, hardness value, the dwell time of the testing force as well as the number of the measurement on its screen. All information such as diagonal lines length of indentation, hardness values, data statistics and hardness conversions can be displayed on the LCD as well as your laptop or PC.